String Quartet for your Wedding Reception – Despite the best laid plans for the day itself, if you’ve booked a string quartet for your wedding reception with your guests coming straight from the church or registry office, do allow a generous amount of time for the move between venues.¬† Although you might have envisaged that 5 minute drive taking everyone no more than 15 minutes, once they are outside the church, guests often take this opportunity to stand around and mingle, take photographs and generally proceed at a leisurely pace to the reception venue (after all, a wedding day is a fabulous chance for people to catch up with each other!). On a couple of occasions, we’ve been booked to provide music for a drinks reception from 2.45pm (with the ceremony finishing¬†round the corner¬†at 2.30pm) and found that guests started to arrive from about 3.15pm onwards. With the photographs taking longer than expected, the bride and groom themselves didn’t arrive until about half past three, so as a result quite a lot of ‘paid for’ quartet time was wasted as we simply had nobody to play to for the first half hour. Normally, we would be happy to add some of this time onto the end of the booking period where possible, but as the meal started on time, everyone was called in to dinner after we’d played for about 2 and a half hours – whereas the couple had booked and paid for three hours. Considering the journey time between church and reception venue is particularly important if your wedding is in Greater London or a major town. You may have driven the journey to time it on a weekday, but Saturday traffic can double or treble the time it takes to get from A to B and slow everything down. If you’re getting married over the summer, the chances are you may wish to hold part of your day’s celebrations outdoors (hopefully basking in beautiful sunshine!) 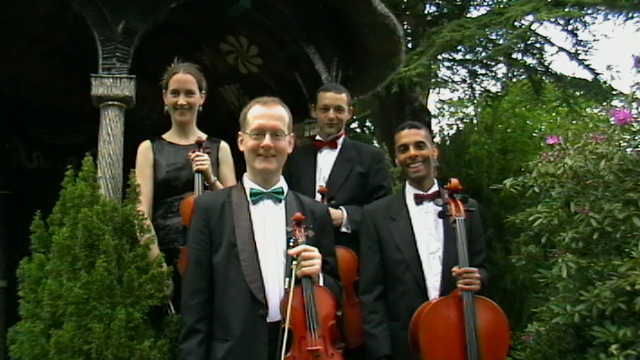 and you’d like the quartet or duo to play outside on the lawns during the reception. This is absolutely fine as long as some thought is given to keeping the stringed instruments protected from the elements.¬† Overall, the cost of a string quartet‘s instruments can be literally tens of thousands of pounds – many of them are irreplaceable antiques and they’ll almost certainly be hand made to suit the playing needs of a professional musician. Hot sunlight or rain can warp or damage the delicate wood and glues that make up the body of the instrument, so it’s essential that you arrange a shaded area such as a gazebo or large garden umbrella to shade the string quartet while they are playing. If your wedding day turns out to be windy, this can also pose challenges as music stands can blow over and onto people and instruments, and the sheet music itself can blow about – despite our firm attempts to keep it in place using pegs. As a violin is held very softly, balancing in the fingers of the player without any gripping, it can literally be blown out of their hand by a strong gust. If it’s very windy, don’t be disappointed if your quartet ask to play indoors – they are only protecting their instruments, and if it’s a very blowy day, it’s likely that many of your guests will want to move to an indoor location anyway. Tomorrows blog will be the final part of this article, and I’ll write about why it’s not always possible to hire a string quartet for very short periods of playing, and how music can be used for different parts of the ceremony.